If you're looking for a handsome leather photo album to preserve your family memories we can create a custom leather family photo album for you. All of our custom leather portfolios are crafted from the highest quality materials available, and are designed to offer years and years of enjoyment. If you've got a theme in mind, or would simply like to have your family name fixed upon the cover, we'll be happy to work with you to find a design that will satisfy your vision of what you'd like to have made. 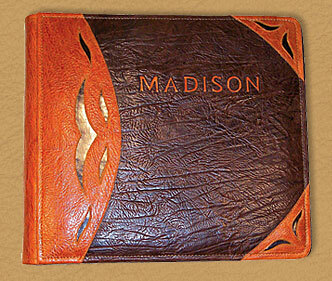 We use several techniques to reproduce your art on the cover leather of our books. Please feel free to give us a call anytime to discuss whatever you may have in mind for your book, and we'll be pleased to help you develop a design that will work for you. You may also be interested in one of our other great products. Please browse our website to view our great custom leather portfolios, leather presentation albums, leather wine totes, personalized leather guestbooks, and leather photo envelopes.